Robert Wood (G. Day) "Cactus"
A painter of realistic landscapes reflecting a vanishing wilderness in America, Robert Wood (not to be confused with Robert E. Wood) is reportedly one of the most mass-produced artists in the United States. His painting became so popular he was unable to meet all of the demands, and many of his works were reproduced in lithographs and mass distributed as prints, place mats, and wall murals by companies including Sears, Roebuck. He was born in Sandgate, Kent on the south coast of England near Dover, the son of W.L. Wood, a famous home and church painter who recognized and supported his son's talent. In fact, he forced his son to paint by keeping him inside to paint rather than playing with his friends. At age 12, Wood entered the South Kensington School of Art. As a youth, he came to the United States in 1910, having served in the Royal Army, and he never returned to England. He traveled extensively all over the United States, especially in the West, often in freight cars, and also painted in Mexico and Canada. His itinerant existence took him to Illinois where he worked as a farmhand, to Pensacola, Florida where he married, briefly in Ohio, Seattle, Washington, and Portland, Oregon. In 1912, he was in Los Angeles, and In the late 1920s and early 1930s, in San Antonio, Texas, where he lived and in 1928 exhibited in the "Texas Wildflower Competition." From San Antonio, he gained a national reputation for his strong colored, dramatic paintings. Some of that prestige has been credited to his asssociation with Jose Arpa, prominent Texas artist. Wood also gave art lessons, and one of his students was Porfirio Salinas. During this period, Wood sometimes signed his paintings G. Day or Trebor, which is Robert spelled backwards. In 1941 he went to California and painted numerous desert and mountain landscapes and coastal scenes. He lived in Carmel for seven years, and then moved to Woodstock, New York, but he soon returned to California, settling first in Laguna Beach, then San Diego, and finally in the High Sierras, where he and his wife built a home and studio near Bishop and lived until his death in 1979. Robert Wood was born March 4, 1889 in Sandgate, England, a small town on the Kentish coast not far from the white cliffs of Dover. His father, W. J. Wood, was a successful painter who recognized Robert's unusual talent. At the age of twelve, his father enrolled Wood in art school in the small town of Folkstone. He then attended the South Kensington School of Art. While attending art school, Wood won four first awards and three second awards, one each year, a record. In 1910 after service in the Royal Army, nineteen-year-old Wood and his friend, Claude Waters, immigrated to America. Initially, he settled in Illinois and worked as a hired hand on a farm belonging to Water's uncle. He would then strike out on his own, living the life of an itinerant painter. Wood traveled as a hobo, hopping freight trains and selling or bartering small paintings to support him along the way. When times were hard, he worked at whatever job was available. In this manner, he saw most of the United States and fell in love with rural America. By 1912, Wood visited Los Angeles for the first time, arriving on the day of the Titanic tragedy. Later that year, he had met, courted and married young Eyssel Del Wagoner in Florida. The couple moved to Ohio where a daughter, Florence, was born. During World War I, the family moved to Seattle where a son, John Robert Wood, was born in 1919. In the early 1920's, the young Wood family was almost constantly on the move. They stayed for short periods in Kansas, Missouri, California and for a longer time in Portland, Oregon, where Wood's friend Claude Waters had settled. Wood's seemingly endless wanderings disrupted his family life and delayed his development as a painter. However, through his travels he developed an appreciation for the American landscape that would inspire him for the rest of his career. Although aware of the current movement away from traditional realism in American art, he elected to travel that solitary path and remain true to his own vision of American’s grandeur and beauty poetically translated through his landscape and seascape paintings. In 1923, the Wood family discovered the beautiful city of San Antonio, Texas and it was there that he and his family would finally settle. He studied briefly at the San Antonio Art School with Spanish colorist Jose Arpa y Perea (1860-1952), who had arrived in San Antonio that same year. In the latter part of the 1920’s, Jose Arpa’s influence quickly became evident. Wood after several years of experimentation was becoming fine easel painter, capable of great subtlety with a new mature original style. 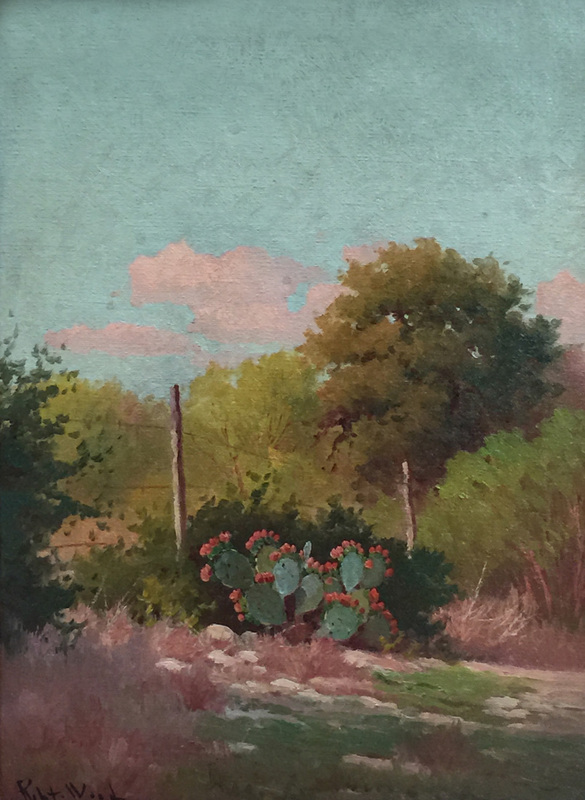 Like Texas painters Robert Onderdonk (1853-1917) and his son Julian Onderdonk (1882-1922), Robert Wood concentrated on the distinctive Texas landscape with its Red Oak trees and wildflowers that covered the hill country landscape. He developed a reputation for his scenes of Blue Bluebonnets, the state flower. In the spring, the Texas prairie is covered with wildflowers, especially in the hill country surrounding San Antonio and Austin. Wood incorporated native stone barns and rough wood farmhouses that added authenticity and romance to his compositions. In 1925, Wood was divorced from his wife. In 1932, he moved to the famous scenic loop on San Antonio's outskirts. While still living in Texas, he took extensive western sketching trips that brought him to California. 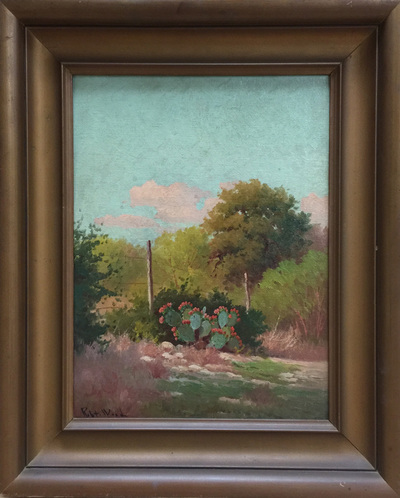 It is evident that his 1930’s California and Texas works started to show his an awareness of the then popular California Plein-Air movement. These more mature works are distinguished by a fine sense of detail reminiscent of late-19th-century American landscape painters laced with the colorful influence of American and French impressionism. With paintings being shipped to dealers across the continent, Wood’s reputation with collectors was growing nationally. It should be noted that from 1924 and 1940 Robert Wood also signed his paintings G. Day (Good Day) and Trebor (Robert backwards). He only used these signatures during these years (1924- 1940) and there is conflicting information as to why. In 1941 after seventeen years in Texas, Robert Wood and his second wife Tula, who he had met in San Antonio, moved to coastal town of Laguna Beach, California. Laguna had been an artist colony since early in the century and it was the birthplace for California Plein-Air School, which was still active. While in Laguna, he developed a following for both his landscapes and marine paintings. Wood's paintings of the California coast remained a significant part of his oeuvre. Living in Laguna for seven years, Robert Wood became an active member of the Laguna Art Association and an exhibitor at the annual Laguna Festival of the Arts. After the War in 1948, the Woods moved east and bought a home Woodstock, New York, which he had visited in the 1930’s. 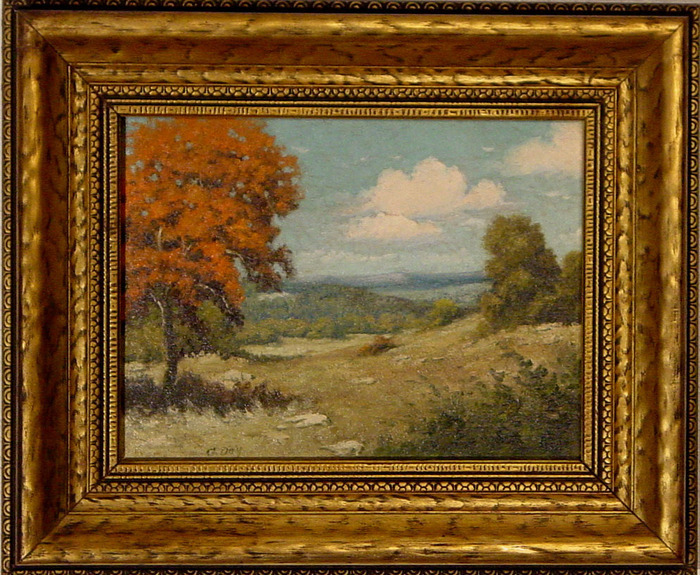 It was a popular artist colony located in the Catskills Mountains. He purchased a studio hidden deep in the Wood Stock forest where Maples and Elms, as well as a quiet brook surrounded his small rustic studio. He found inspiration from the bold autumn colors of the forest, the Catskill Mountains covered in pillows of snow and the blossoming fruit trees of spring. During this period, he made sketching trips to New Hampshire, Vermont and along the Maine coast. 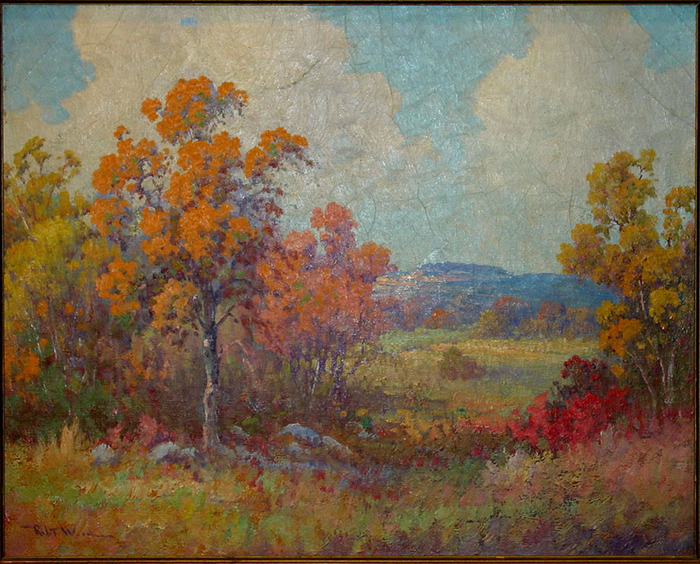 Although included in his eastern subjects, these Vermont, New Hampshire and Maine subjects are rare when compared to the hundreds of paintings done while in Woodstock. The public was captivated with Roberts Wood’s seasonal Woodstock paintings. He began working with an inexpensive print publishing house (possibly Donald Art Publishing Co.) to reproduce several of his paintings. The reproductions were an immediate success. October Morn, which was his most successful prints, sold more than one million copies in less than two years. These inexpensive paper reproductions made Robert Wood one of American’s most famous landscape painters. After a few years in New York, Robert and Tula moved back to Laguna Beach. 1952 and 1953 were tumultuous years for Robert Wood. He and Tula became increasingly estranged and they were divorced in 1952. The following year, Wood was hit by a car on Pacific Coast Highway and nearly died. His friend and amateur artist Caryl Price helped him around the house during his recovery and the two were soon married. He had instructed Caryl in painting and he would take her on sketching trips all throughout the west. During the 1950's, a combination of the popularity of Robert Wood's paintings and his print royalties eventually made him a comfortable living. It was during this period that Grand Tetons became a favorite subject. Although Robert Wood painted extensively in the Colorado Rockies in the 1930s and 1940s, he did not paint the Tetons until the late 1950s. By the early 1960s, the Tetons and the California coast made up a significant percentage of his artistic production. 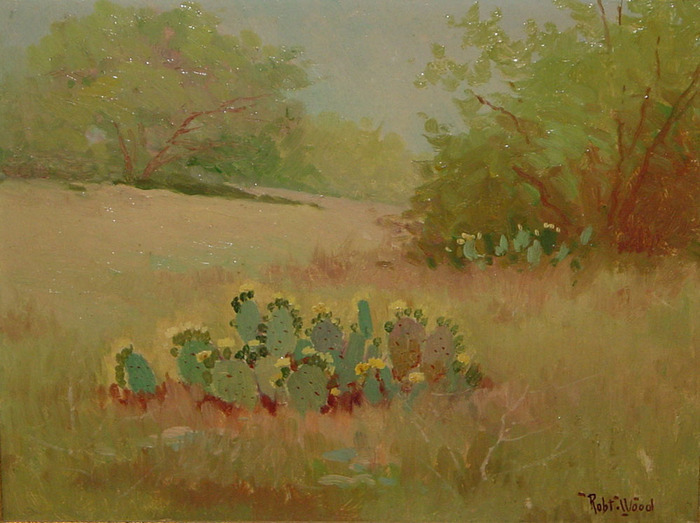 Wood would continue to paint his popular Texas landscapes but his style had changed. Works from this period are more broadly painted with a more chromatic palette, which was considerably different than those from the 1930s and 1940s. In the 1960's, Robert Wood's found great success and his paintings brought higher prices, some selling in excess of five thousand dollars. At the age of eighty, the American Express Company commissioned him to paint a series of six works to be reproduced as limited edition serigraphs for their Cardholders. Each print depicted one of the National Parks, subjects that were well known to Wood. Around 1964, Robert and Caryl Wood moved San Diego. They had purchased a wonderful Victorian house that Caryl wanted to restore. After several years in San Diego, they finally moved back to Bishop and the Sierras. Wood remained active and he continued to paint until just prior to his death in the spring of 1979, just weeks before his 90th birthday. Although Robert Wood shunned publicity and was modest about his accomplishments, he had millions of admirers who mourned his passing. There are thousands of artists in this country who learned a great deal by studying his work, his reproductions and through the art instruction books he authored for Walter Foster publishing.